Winter has lingered into spring, but Beth and Chris Leipler already have spent several months preparing for their second growing season at Tioga Valley Farm in West Falls. “We’re looking forward to another year,” Beth Leipler said this week. 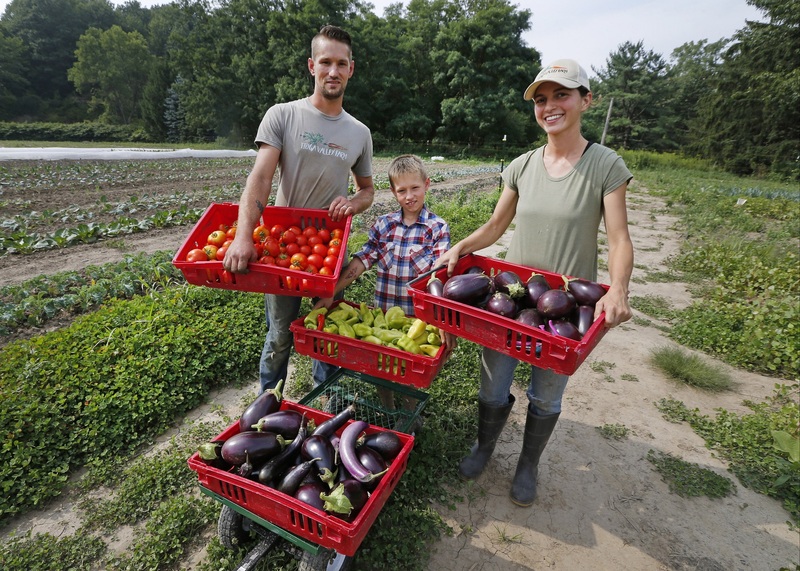 The farm is among at least 10 in the region that offer Community Supported Agriculture (CSA) shares – essentially giving customers a stuffed shopping-size bag of its weekly bounty through the growing season. Those who want to get in on the action should do so soon. 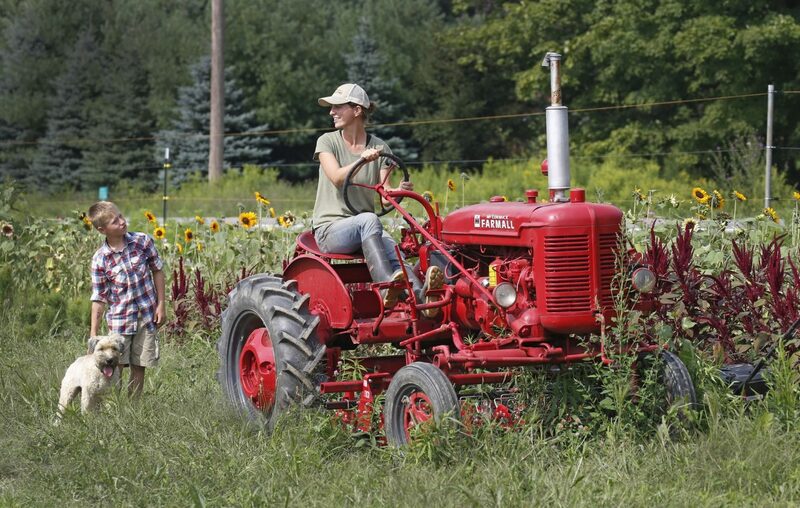 Tioga Valley, a six-acre patch on Davis Road – about a 15-minute drive from East Aurora and parts of Hamburg and Orchard Park – is offering 100 shares this season, compared to 60 last year. Half are gone, gobbled up mostly by repeat customers. Each farm puts its own stamp on the CSA experience. Tioga Farms shareholders can visit the farm once a week, from 3 to 6 p.m. either Tuesday or Thursday. They will take home mostly seasonal vegetables, and some fruits –as many as 140 different crop varieties – from early June to late October. Q: How will the CSA work? When customers come to the farm, they'll come to a share room and get a large choice in the vegetables they take home, all except for about the first two weeks when we have more limited vegetables. We have a mix-and-match section. A whole bunch of vegetables are laid out and customers get to fill their bag halfway if they're a half share and full if they're a large share. In addition to that, they have a few designated items they get to take home. After that, most of our customers take advantage of our free U-pick section. They'll pick from a variety of vegetables such as beans, peas, cherry tomatoes, herbs and a cut flower section. We feel that increased relationship really helps with member retention. Q: Why should somebody choose a CSA? The benefits from a customer's perspective is they get to receive a weekly supply of incredibly fresh and nutritious vegetables that in our case are grown without any synthetic chemicals. We grow organically but we're not certified. It helps them to eat healthier, cook more. In a lot of cases, customers save money. With our customers, we ensure every week that the price they're paying for the share is less than organic retail pricing and a higher value than what is sold at a farmers market. For a lot of members, the farm they sign up for with a CSA share often becomes their farm. Whoever is growing their vegetables becomes their farmer. That's a fun aspect of it. They get so spend time on the farm every week. What we really enjoy is families coming to the farm. Kids get to spend more time outdoors, get to create a better relationship with healthy food by going out in the field and snacking on sugar snap peas and cherry tomatoes and things like that. Q: What will be the most common items? We have all your classics. People love cucumbers and summer squash and other garden variety vegetables: cabbage, beans, carrots. We're growing corn this year. Peppers, eggplant. We successfully had a salad green every week in the share last year. Your winter squashes, onions, melons, cooking greens. Tomatoes are a really big one. Q: What about some of the rarer varieties? Purple potatoes, rainbow carrots, fennel, radicchio, Asian eggplant and edible flowers. Also rare would be celeriac, which is related to celery. It's a bulbous root that can be cooked similarly to potatoes. Kohlrabi is something you'll see in the grocery store but is new to a lot of customers. We grow a lot of varieties of winter squash that aren't so common in the grocery store. We'll do okra. We're growing ground cherries. They were really popular last year. It's a husked fruit similar to a tomatillo but they're really, really sweet. We have them in our U-pick section. We're growing ethnic greens this year. One of them is called callaloo, a spinach alternative popular in Jamaica. Q: What are folks likely to see in their shares as the season goes along? The first couple of weeks in the early spring consist of a lot of greens. You'll see a lot of salad greens, bok choy, spinach and some of your quicker crops like radishes and salad turnips. The later you get in the season, the heavier the shares get. It goes to your summer squash and your cucumbers and your tomatoes. As you get later in the season, you get a lot more of your storage crops, such as onions, potatoes, winter squash. You'll see an appearance of some of your cold crops in the spring, like cabbage and broccoli, and you'll see them again in the fall. A lot of things are season long, like your salad greens and cooking greens. Same as last year. We have small shares available for $425 and large shares for $625. The big share is almost double the small share. A lot of people split the large share with family and friends. We have signup forms on our website, tiogavalleyfarm.com. They can print up the form and send it in with their deposit. They can also email us with questions at tiogavalleyfarm@gmail.com. We also have online ordering where they can pay by credit card with a small processing fee. The small share breaks down to about $20 a week and would have a retail value of at least $25. U-pick is a bonus and isn't included in that dollar value. Q: How are things going with your five-acre agroforest outside Portland, Jamaica? We got down there for about a month this winter, which was awesome. We planted a bunch of coconut trees. We're working with a local farmer who is planting taro, or dasheen as they call it down there. It's a specialty (root vegetable) crop you'll see in stores around here sometimes but it's popular in a lot of countries around the world.